Shnergle did not begin as Shnergle. After the evening that hatched the idea behind Shnergle, Rob and I set to work on the practicalities of the concept. We assigned a temporary name to the project, with the view to come back to it again when we could figure out how the concept could be executed. No point having the best name and the worst concept. A lot of time can, and arguably should, be spent on choosing the right brand name, as you’ll be stuck with it indefinitely. A name is after all your identity to differentiate you from your competitors and takes a while to build and will be costly to change. It is also the first encounter people have with your company; the smile at the front door. From first entry into the market, perceptions and associations will be drawn and attributed to the name. needed to be easy to pronounce and sound good. 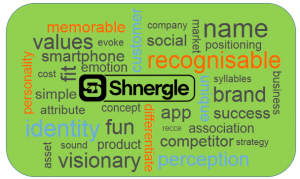 The majority of smartphone apps were simple one or two-word names, usually no more than three syllables. must be memorable so that it transfers more readily through word of mouth. Something fun to say, maybe even able to convert for use as either noun, adjective or verb. must be unique so that it can be found quickly in searches. Not lend itself to confusion with a similar already established brand. We’ve all had those great resolutions when we’re lying in bed not even thinking about the issue concerning us, and then wham! It comes to you. For us, it happened after lunch on returning to our desks when Rob turned to me and simply said “how about Shnergle?” It instantly registered with me. I had used the word often in my past. It was a synonym for recce (or reconnaissance), that evoked stealth search in military circles; to find out information on an area of strategic interest. It was recognisable to me and would be to approximately 100,000 soldiers in the UK, but would it make sense to others? Could we make it recognisable to everyone else? Time will tell. Any other random, obscure name had no more chance of success and doubtful close association to our concept. I didn’t want to fully agree straightaway as we hadn’t even began brainstorming for it yet. We didn’t want to get it wrong, but it did fit. We couldn’t see a reason not to use it so we went with it; it certainly beat Ajax!